Paris has fallen. New York is a pile of rubble spilling into the Atlantic. Alien attacks against Nanjing and Changzhou prompt widespread panic throughout the streets of Shanghai. Defense satellites detect UFOs in orbit over Mexico, Russia, and Brazil. Military responses have proven ineffectual. Fear and anxiety lead to widespread riots. Human civilization stands upon the brink of collapse. You are humanitys last hope. 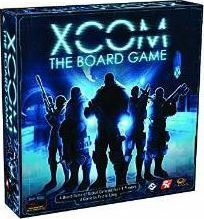 In XCOM: The Board Game, you and up to three friends assume the roles of the leaders of the elite, international organization known as XCOM. It is your job to defend humanity, quell the rising panic, and turn back the escalating alien invasion coordinated by the games innovative, free digital companion app. Where the worlds militaries have failed to stand against the alien invaders, you must succeed. To do so, you must make strategic use of the resources available to you. You must launch Interceptors to shoot down alien UFOs, assign soldiers to key missions, research alien technology, and use that technology to defend your base, all while you try to keep the world from collapsing just long enough that you can coordinate one final mission to repel the invaders for good. Destroy UFOs. Research alien technology. Defend your base. Uncover the alien invasion plan. Should you fail, humanity is doomed.